Mi2N.com - ARE WE LIVING "THE GOOD LIFE?" ARE WE LIVING "THE GOOD LIFE?" 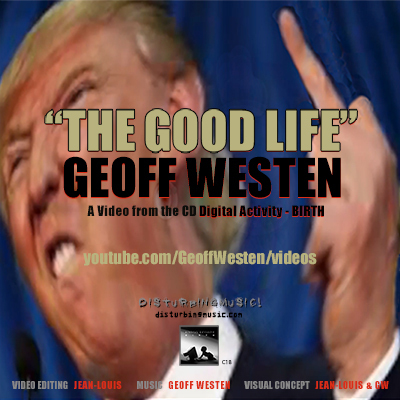 LOS ANGELES August 14, 2018 - Geoff Westen and videographer Jean-Louis have created a thoughtful and timely commentary on our world today, for "The Good Life" from Westen's album, DIGITAL ACTIVITY - Birth. The video's title intimates that it would be optimum if we could all just be happy. "The Good Life" should consist of memories of innocence, respect for nature and all forms of life, and living our lives in a just and peaceful way. But that is not today's reality. Our traditions don't look like they used to. We don't live in a "Father Knows Best" world anymore. We are living in the chaos created by a handful of maniacs who want to rule the world. Such is the good life in 2018. GW and Jean-Louis honor the good life, in hopes that we can find our way to survive and create a better world. Maybe there's too much tweeting while Rome burns! The music from Westen�s BIRTH album is the genesis of his Rock Ambient style - an alternative to his highly regarded pop rock albums. �The Good Life� showcases his quirky remake of the Tony Bennett classic.